Evanger's pet food is one of the sponsors of the Lulu's Favorite Things Campaign, which raises money for Harbor House of Central Florida's Paws for Peace Walk. Thanks to the help of companies like Evanger's, we raised $500 for Harbor House. You can continue to help us raise money by going to the Harbor House website. And keep reading for our great giveaway below. Hello all, Galadriel here. Servant is supposed to write these posts on Saturday, but she is useless. She kept trying to get me to pose too. What am I, a dog? She is trying to get me to pitch a dog food too. But the company makes dog food I can eat. Weird, huh? 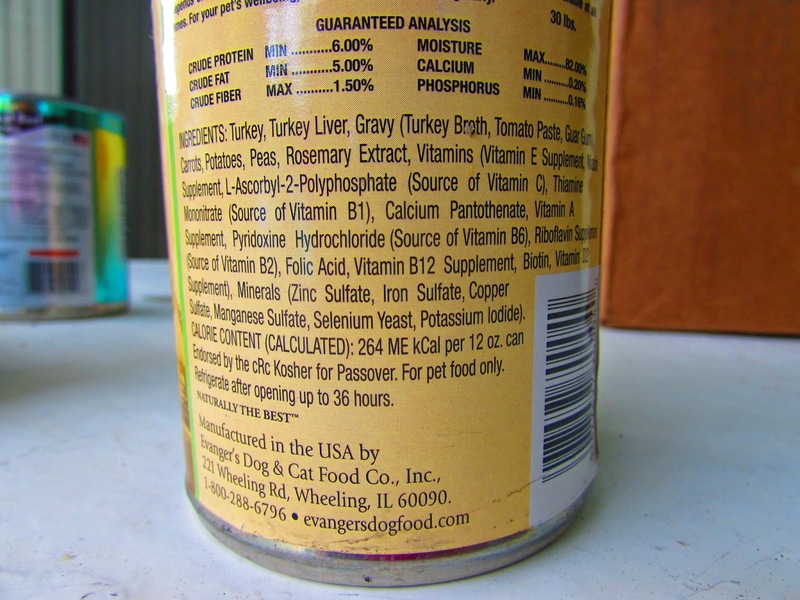 Evanger's has been making pet food since 1935. And it's all made in the USA, right in Illinois. They have several varieties, including the new super premium line, and grain-free line. Mom especially likes the grain-free line. 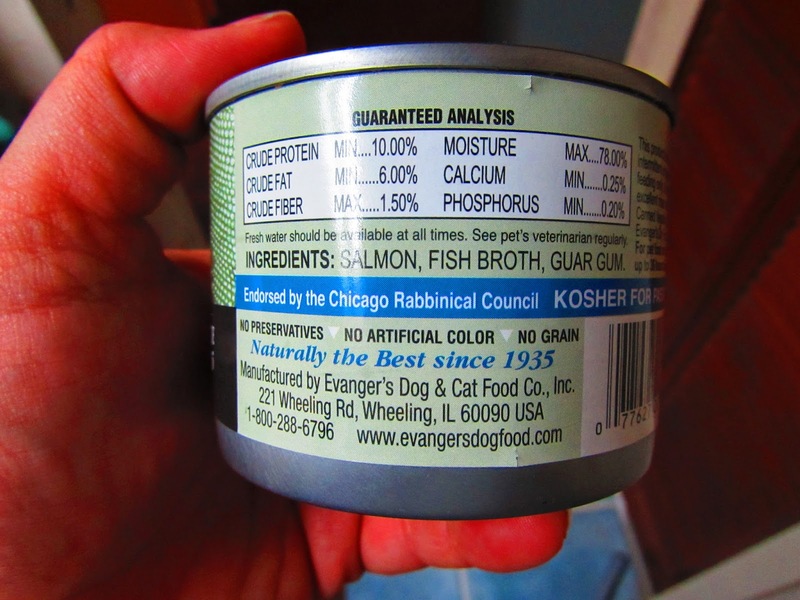 Look at this ingredient list on the can of salmon. That's it, three ingredients on this can. This is not a complete meal though, these grain free cans. They are meant to be meal toppers. And dogs and cats can eat these. Still the first ingredients are all natural and wholesome. Did you notice something else? Evanger's food is Kosher for Passover? It's approved by the Chicago Rabbinical Council. 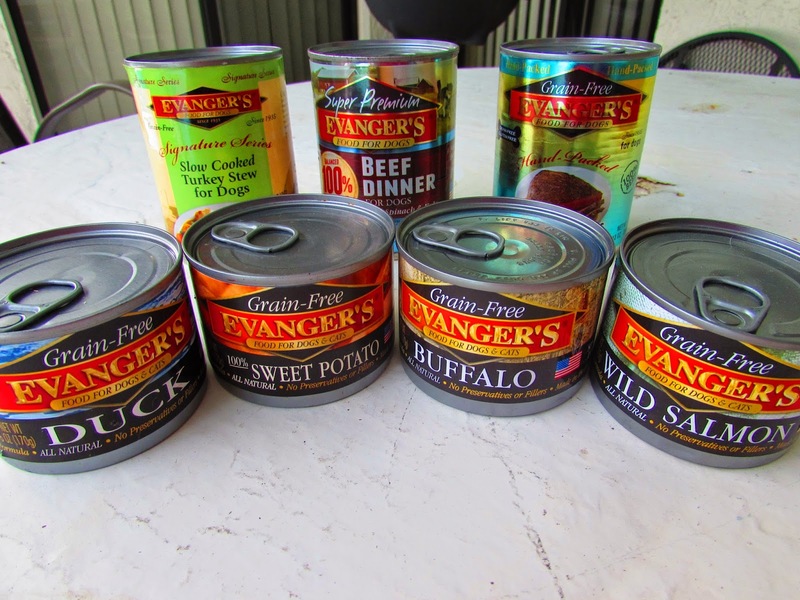 Evanger's has a new line -- Super premium food. It's mostly for dogs, though the sweet potato is safe for cats too. In the super premium line, there are lots of vitamins from spinach and kale. There's chicken, beef, duck and lamb and rice. There's also a vegetarian variety if your dog prefers. You can find Evanger's in boutique stores and online. They also sell dry food and treats. Now! Here's your chance to win some Evanger's food. Remember, it's made in the USA with wholesome ingredients! The giveaway ends July 2. All you have to do is follow the Rafflecopter's instructions, and be sure to leave me a comment. The fine print: This post is sponsored by Evanger's. I am being compensated for helping spread the word about Evanger's, but we only share information we feel is relevant to our readers. Evanger's is not responsible for the content of this article. Not really, meat seems to be a big plus with my cocker. Meat and cheese are my dogs favorites. They especially love cheese although I think two of them are allergic to it so I don't give them it anymore. No, he basically eats whatever I give him. No. i switch things up a lot so they get a variety and don't become picky about their food. 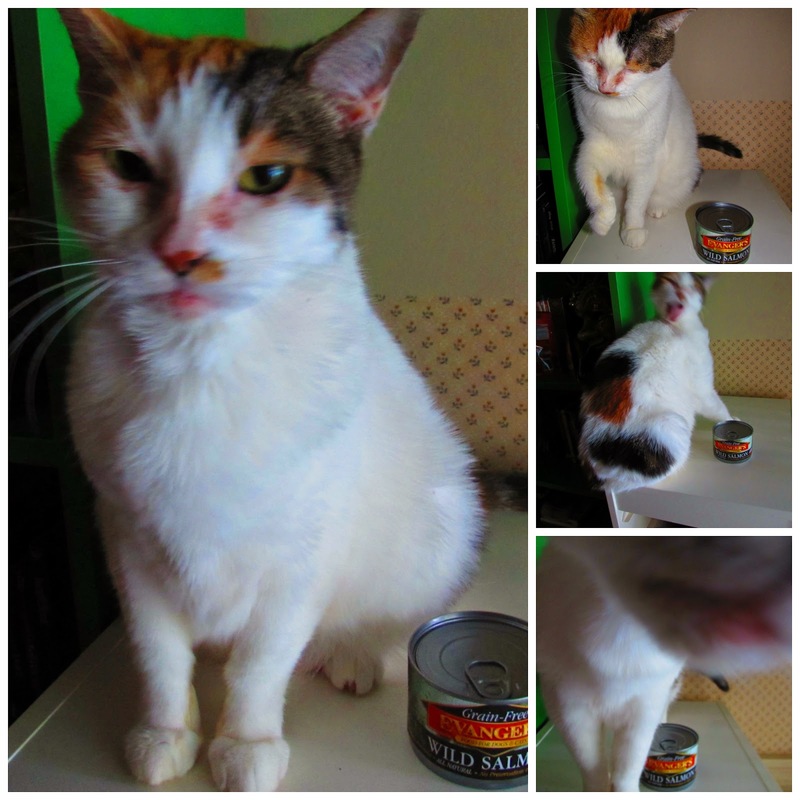 Wow, cat sponsored food. your dog will love this. My 2 younger dogs will eat just about anything but my 13 year old she has very picky taste-buds. She can tell which is the top of the line food and loves things like Honest Kitchen and Merrick. Stella loves her grandma's meatloaf more than anything else! And she knows Grammy super generous with the portions much to my chagrin! Our younger dog will eat anything but our older girl is more picky but even she can't say no when we make steak! My chocolate lab will eat absolutely anything. He eats so fast I don't think he even tastes his food.